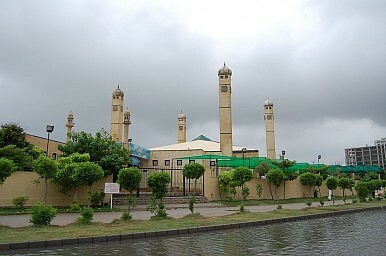 An actual mosque in Karachi's army housing development. A closer look at the 10,000 ghost madrassas in Sindh province. Sindh, the southern province of Pakistan, has always been an epicenter of progressive political parties which keep a close check over the spread of religious militancy and violent extremism in their constituencies. Even though Sindh has been a secular and progressive region, where Sufi traditions have never let the militant mindset prevail, the province still supports tens of thousands of madrassas, Islamic religious schools. There’s just one problem: many of these supposed madrassas don’t actually exist. A meeting of officials of Sindh, held in May at the chief minister’s house in the provincial capital of Karachi, was told by the inspector general of the Sindh police that over 10,000 ghost madrassas had been unearthed through physical verification. This verification was made after 7,724 actual madrassas were geo-tagged. Ghost schools have been a point of debate in Pakistan for many years but this new term, “ghost madrassas,” has stayed under the radar. Ghost schools exist only in government books, from which they receive annual funding from the education budget. As a result, individuals are able to pocket funds meant for schools that do not actually exist on the ground. Recently, Sindh managed to largely root out such ghost schools; now it has to cope with the new phenomena of ghost madrassas. Ghost schools are supposedly government entities, and the provincial government provides funds for them. But who is funding these 10,000 ghost madrassas, and who is benefiting? What is the purpose of these ghost madrassas? After all, they exist only on paper, yet most of them are unregistered with the relevant authorities. Whatever funds they get don’t come from the state. To answer these questions, I spoke to police officers and other members of law enforcement agencies, including a senior official with an intelligence agency. These interviews revealed that ghost madrassas serve as revenue streams for various religious groups, most of which are engaged in militancy and violent extremism. A few of the figures behind these ghost madrassas have political motives, while some are believed to run ghost madrassas to meet the needs of their families. Being a hub of Pakistan’s economy and home to the major port city of Karachi, the province of Sindh alone produces around 65 percent of the total revenue of Pakistan. As a result, it also provides a conducive environment to those seeking to exploit religion to provide their own revenue stream — including militants. So how do these ghost madrassas generate money when they are not funded by the government, unlike ghost schools? Interestingly, I was told that the most active source of their revenue has been intercity bus routes. The most common method of fundraising is simply for a bearded man, carrying a booklet of receipts, to board a bus and ask passengers to donate to the ongoing construction of his madrassa or mosque. Sometimes they resort to emotionally blackmailing the passengers by asking for their help in feeding readers of the Quran. Scores of ghost madrassas are promoted as an “additional room” for a mosque. These ghost madrasas also collect animal hides on Eid and gather funds by visiting businessman. Others, rather than collecting funds from bus passengers, have collection boxes in shops, gas stations, or shopping malls; they also operate online accounts and promote themselves on social media. Many ghost madrassas have bank accounts that they mention on their banners, which are usually hung during holy days. The major chunk of ghost madrassas come from a group of activists who run their collection drive in areas where the upper class congregates, such as Khadda market in the army’s housing development in Karachi. A senior intelligence officer revealed that ghost madrassas usually operate through bank accounts fusing their fake madrassas and registered non-governmental organizations. When asked to elaborate on the mixture of NGOs and ghost madrasas, the officer said the perpetrators want to keep their revenue intact, avoiding Zakat al-Fitr and tax deductions. Thus, they operate through a registered non-profit organization. They use these bank accounts especially to generate funds from social media and members of the community living abroad. The official also said that the ghost madrassa fundraisers are often involved in money laundering. Through the money they raise, they have been investing in real estate. Ghost madrassas have been a successful endeavor because most Pakistanis pay the fundraisers without verifying if their mosque or madrasas actually exists. While I was investigating ghost madrassas, I took a bus trip from Lyari to Thatta and back, a distance of around 15 km. Sure enough, two boys boarded the bus and started requesting funds for their madrassa, supposedly being built at Cattle Colony bus stop. This made me remember the days when I used to travel by bus from Steel Town to Millennium Mall to reach my college. Every day, someone would board the bus asking for funds for the same madrassa, which after nine years is still supposedly under construction. Sindh’s inspector general claims there are around 10,000 ghost madrassas in the province; the real number may be far larger. And that is just in Sindh, while this is a problem for all of Pakistan. Under the guise of fundraising for religion, madrassas, and mosques, the public is easily tricked. The majority of people don’t verify that the mosque or madrassa in questions exists before handing over their money to the ghost madrassa mafia — this is how we have been fueling the thousands of criminals and militants who taken up this lucrative business. Pakistan and the Sea: Preserving the Marine EnvironmentAttack on the Chinese Consulate in Karachi: Not the First Nor the LastPakistan's New Government Fails Its First Major Test on ExtremismWhy Pakistan's Ruling Elite Are Losing the Narrative War Against Radical IslamistsIs the Pakhtun Tahaffuz Movement a Threat to the Pakistani Military's Interests?